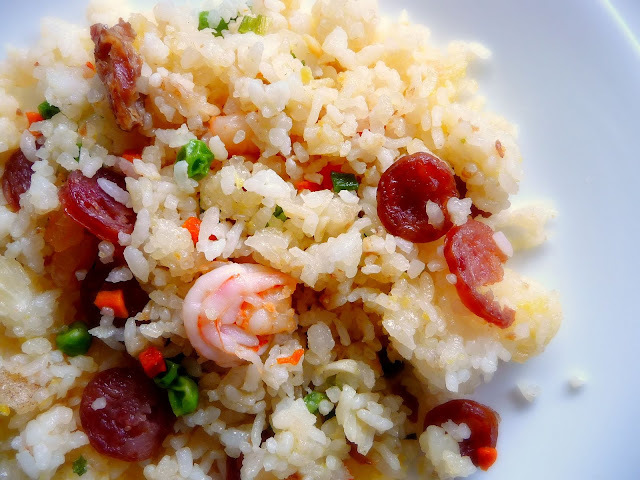 Traditionally, Yang Chow fried rice is made with diced roast pork. I substitued it with Chinese sausage only because it is cheaper and easier to find. I hope you enjoy it too. 1. Heat up about a 1 tablespoon of oil in a wok. Add the Chinese sausage and cook until just about the color is starting to change. Set aside. 2. Heat up the rest of the cooking oil in the same wok. Add garlic and onions, and then add the carrots and cook until almost tender. 3. Add the shrimps and mix well until evenly cooked. 4. Add the cooked rice and green peas and blend well with the ingredients already in the wok. 5. Make a crater in the center of the wok by pushing the rice up the sides of the wok. Place the beaten egg in the crater and let sit until it is just about starting to form solid. Stir the egg in itself in the crater. Just before it turns solid, blend it evenly with the rice. Season with salt and add the sausage and green onions. There are many different brands of Chinese sausage. You can find them in the refrigerator section of most Asian markets for under $5.